Lately I have been wanting to cram my full ATX computer into the smallest case possible. I have been using my Google-fu extensively and have found some pretty sweet manufactured SFF cases. Yet they were not that small which was totally understandable. My hardware is Full ATX which is demanding of a larger case because that is the purpose of my current hardware. Then I came across a few custom scratch built SFF cases, but none were that visually appealing yet still awesome none the less. Currently I don’t have the time to build my very own custom built SFF case. Even though I am itching to tinker with making one. Because who doesn’t love purchasing new hardware on Amazon and Newegg??? So I have set my sights to looking for the smallest form factor PC you can purchase outright. Now this is quite the journey and may be a little more expensive than making my own PC and searching for the Deal of the century on parts. It is still new hardware regardless, it’s just missing that satisfaction of diving in and piecing it together. Then you can match it up with whatever hard drive size fits your needs. You can check it out in this budget build by Tech By Matt. Small cube that can fit pretty much anywhere. Check out this video Paul’s Hardware did building up a PC with this case. 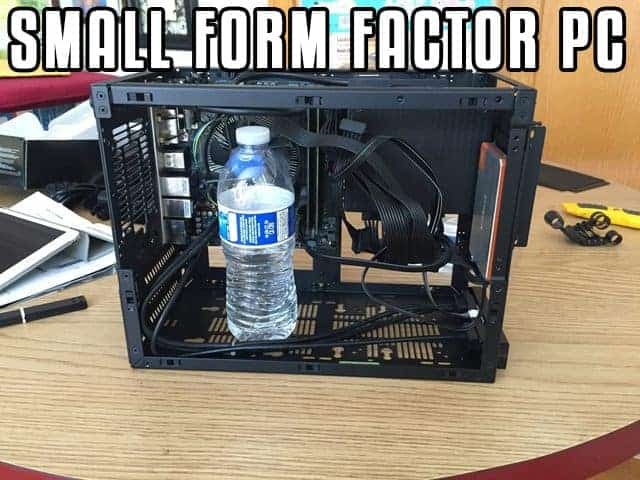 This list of small form factor PC cases can keep going. I tried to narrow it down to some styles that I liked. This might ease your decision on what case to pick up. If I happen to see an awesome case in the future I will update this post. Until then, see you in the next post.